In this series of blogs about my professional life and the individuals I’ve met who shaped my life and career, I’ve neglected to pay attention to the those who came before me and made possible all I’ve experienced these many years. And in that story, one element stands out in such stark contrast to the life of safety, security, and ever evolving possibilities I live today, that it must be revisited. This story then begins long before Hitler’s final solution. It begins at Ellis Island, New York in 1900. Avraham Silber and his sister Rose stepped off a boat that had just sailed by a beckoning Statue of Liberty, at the end of their journey from Austria-Hungary, to settle in America as immigrants. That statue welcomed them to a new land. They began work in the sweat shops of the lower east side of Manhattan, and before long, Avraham had saved enough to open his own shop – a shirt factory. They did well. Avraham married Lana and together they had 5 children, 3 daughters and 2 sons. My father, Moshe ben Avraham (known by his nickname “Mundek” and by his Polish name – Maurycy) was the youngest of all 5. Avraham used his wealth to contribute to the town and all its citizen – Jew and non-Jew. He was considered the town patriarch by many. Avraham wanted Mundek to become a rabbi and so my father studied with famous rabbis in Poland. But Mundek saw himself as something else – something more secular and he begged his father to arrange a secular education. Avraham bribed the headmaster of the Gymnasium – the Polish secondary school in Lvov – to allow Mundek to attend class. Jews generally were not otherwise allowed in the primarily Catholic educational system in Poland. Mundek and 4 other Jews sat on a back bench in class. They were often the subjects of anti-Semitic slurs. In fact, Mundek’s Catholic friend, George Progulski would phone Avraham’s house every morning to let Mundek know if it was safe to come to school or if there were anti-Jewish demonstrations in Lvov that day. By 1932, the year Mundek graduated from Gymnasium, it was clear he wanted a career in medicine. Avraham indulged him, but Jews could not attend medical school in Poland. Mundek was accepted into the Medical school at the University of Bologna in Italy, and later, the University of Genoa. In 1937, Avraham lay deathly ill in Lemberg. Hitler had come to power in Germany and Poland, in an effort to appease him, passed anti-Jewish laws, prohibiting Jews from owning businesses. Avraham and Lana had to sell the lumber business and move in with their oldest daughter in Lvov. Mundek went to see his dying father. Avraham saw the future all too clearly. He made Mundek swear that upon graduation he would leave Europe and find his Aunt Rose in New York. And just in case he needed money, Lana sewed a nail file made of platinum into his coat that he could convert to cash or use as a bribe if needed. Mundek returned to Italy and with the help of his Aunt Rose and her family in New York, obtained a visa to travel to the US after graduation. He also obtained a visa for nearby Switzerland just in case war prevented him from reaching the United States. Jews from Eastern Europe as well as Jews from Germany, were already being prevented from entering the United States by an isolationist congress. By December 1938, 5 months after getting his medical degree, Mundek boarded a boat leaving Genoa for Ellis Island. Rose died a few months before he left Europe, but no one in her family wanted him to know, fearing he might not leave what was clearly a dangerous place for Jews. He learned of her death upon his arrival. And 10 months after he set foot in America, Germany invaded Poland from the west, and Russia shortly thereafter, from the East. Lvov was now in Russian hands. Mundek made his way to Washington every Sunday so on Monday morning he could go to congress and petition for an increase in the Polish immigration quota and get his mother, his sisters, their husbands, their 12 children (my cousins) and his brother out of harm’s way. Congress refused. 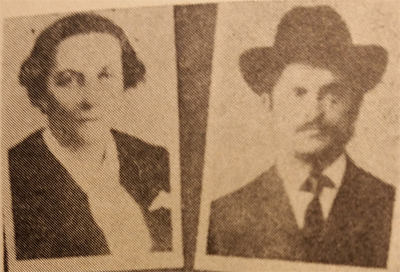 Mundek, with help from Rose’s new family, was able to arrange a private aircraft to take his older brother Chaim out of the Russian zone to Scandinavia. Chaim eventually made his way to the Dominican Republic and then the US where he joined the US Army and fought in Europe. By June 1941 Hitler attacked the Soviet Union and soon occupied all of Poland. Lvov was turned into a ghetto with regular transports to the death camps. Lana died painfully of peritonitis in the ghetto. My aunts, my uncles, and my cousins were all murdered either in brutal so-called actions, violent attacks perpetrated by Nazis and Ukrainian Nationalists, or after transport to the gas chambers. What would have blossomed from those lives saved if congress had simply followed America’s core values and allowed the burning beacon of liberty to welcome all those family members to her shores? What contributions could my cousins have made to our society as doctors, lawyers, teachers, musicians, husbands and wives, mothers and fathers of a new generation; all lost now. Mundek was offered a commission in the US Army just after Pearl Harbor and served with distinction in Europe with a medical battalion – landing in France on D-day +11. He only learned the fate of his family after the war ended, and some of it, not until a trip to Israel in 1970, from other survivors of the Lvov ghetto. So today, as refugees and immigrants are barred from our shores, I cannot fail to see the pain and suffering that will surely follow. Oh America, where art thou in their time of need?